1.) Tested and 'Tested' - Not only do we lab-test our bike locks, but we give our bicycle locks a serious GO ourselves as well. Fun ensured! 2.) Double Bolt - A Double Bolt Mechanism secures both sides to the crossbar for high resistance to pulling, jacking and prying. 3.) Extra Security - A braided 1200 mm Flex Cable is included for extra security or locking several bicycles at once. 4.) Convenience - With a sturdy Mounting Bracket, a One-Button Release and a Velcro Strap parking your bike every day is like a walk in the park. 5.) 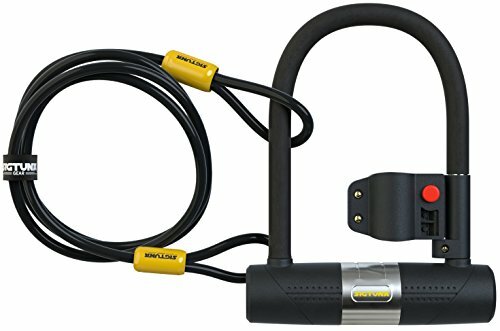 Durabililty - With a Hardened-Steel U-shackle, a sturdy Mounting Bracket and a braided Bike Lock Cable this bicycle lock will protect your bike season after season. ANTI-THEFT DESIGN ► This Model U-lock has a High Security Disc-Style Cylinder and Double Deadbolt locking mechanism, very effective against Leverage Attacks. 100% MONEY-BACK GUARANTEE ► If this U-lock is not the favorite you ever owned - some say it is heavy, but that means quality - just send it back and get a 100% refund. SIGTUNA stands for its products. Our customers love that, we know you will too!